Weekly Happenings: This past week held a couple of big events, both on the same day, oddly enough. Thursday was our fifteenth wedding anniversary (it’s crazy to think it’s been that long). 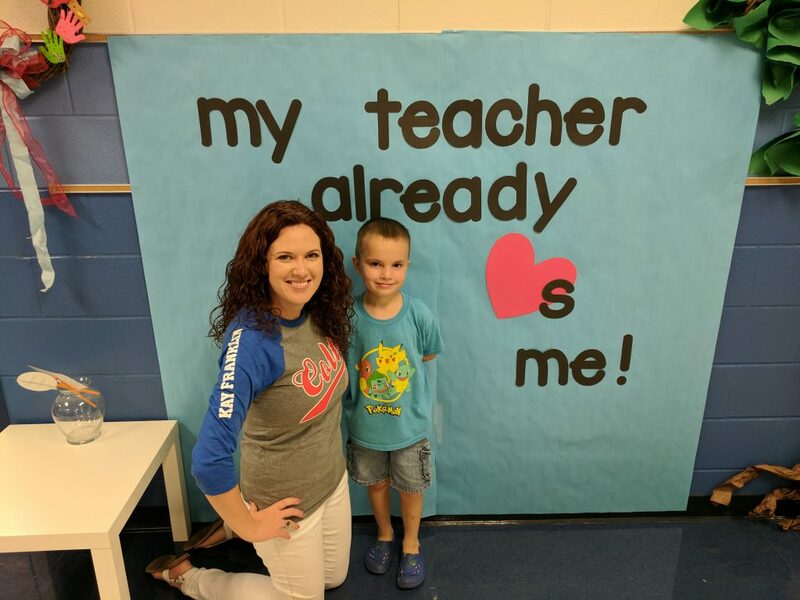 It was also Meet the Teacher where Joseph got to meet his new teacher for this upcoming school year. She seems really great and we’re all excited for the new year to begin tomorrow. The Weekly Weather: The week started out pretty normal. Towards the end of the week, we started seeing the effects of Hurricane Harvey. It pretty much ravaged the coast, around Corpus Christi, Rockport, and Port Aransas. Houston is experiencing some flooding. So far, we’ve only experienced some gusty and rainy days. Rain is in the forecast for the next few days as a continued result. Hopefully we won’t experience any flooding out here, but we’ll see. What Paul’s Been Up To: Not too much out of the ordinary. He had a good week at work and even got off a bit early on Friday since they wanted everyone to get home before the storms hit. What Sarah’s Been Up To: Other than having a dentist appointment, this was a pretty average week for me, too. 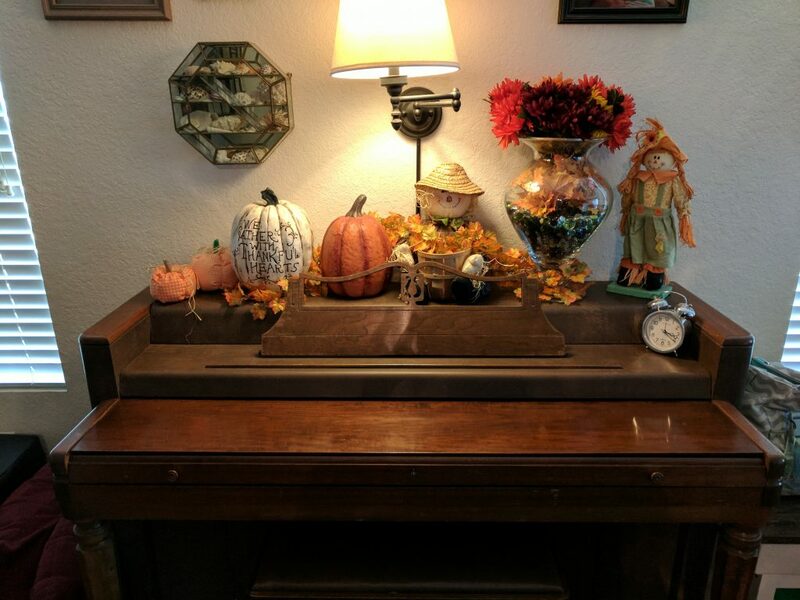 One fun thing I did was to put up our fall decorations. I know it’s early, but I couldn’t wait any longer, haha. I love the holidays! What Joseph’s Been Up To: He’s enjoyed one last week of summer vacation and was super excited to find out that a couple of his pre-k friends will be in his kindergarten class. What Abigail’s Been Up To: She’s still fighting the effects of the antibiotics from her bout with salmonella, but seems to slowly be getting them out of her system. She’s pretty much her happy, smiley self again. She has been experimenting more with sounds (usually at an increased volume, haha) and has shown interest in playing peek-a-boo (though I’ve learned that if you hide for more than five seconds, she forgets you’re still there and is genuinely startled when you appear again). 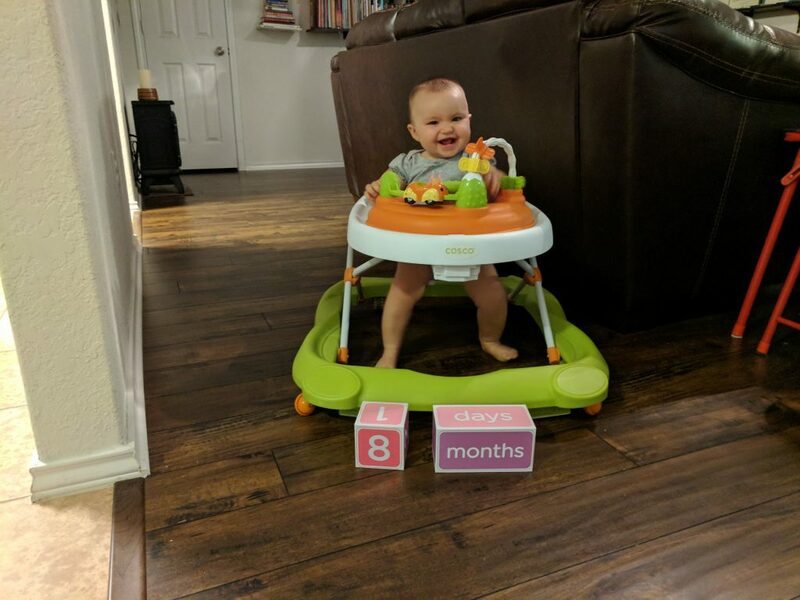 Oh, and she also officially hit the eight month mark. It’s hard to believe that in four months we’ll be celebrating her first birthday. It’s hard to believe this scrunchy-nosed, smiley girl has been part of our lives for eight months! Maybe this will encourage cooler temperatures to head our way…or at least let me imagine it, haha. Joseph and his kindergarten teacher, Mrs. Adams. 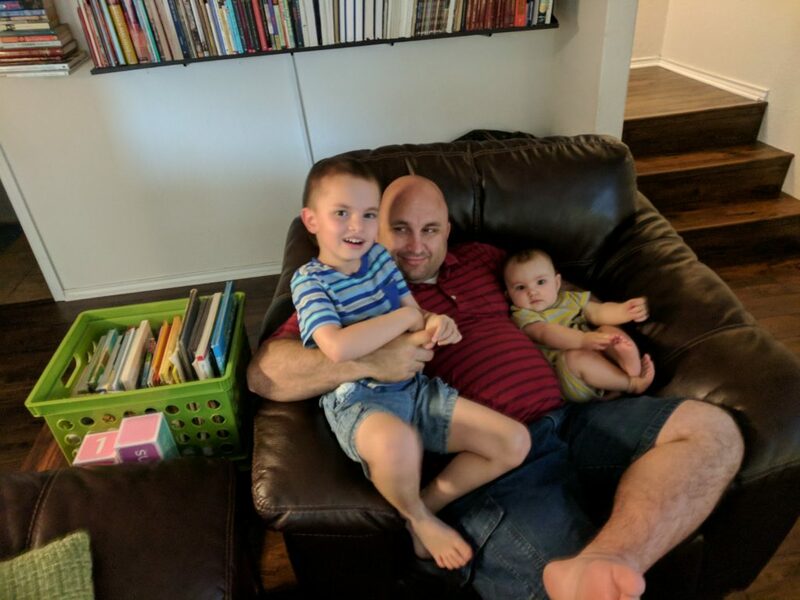 Daddy and his babies. I love the striped shirt theme they had going here (unplanned). 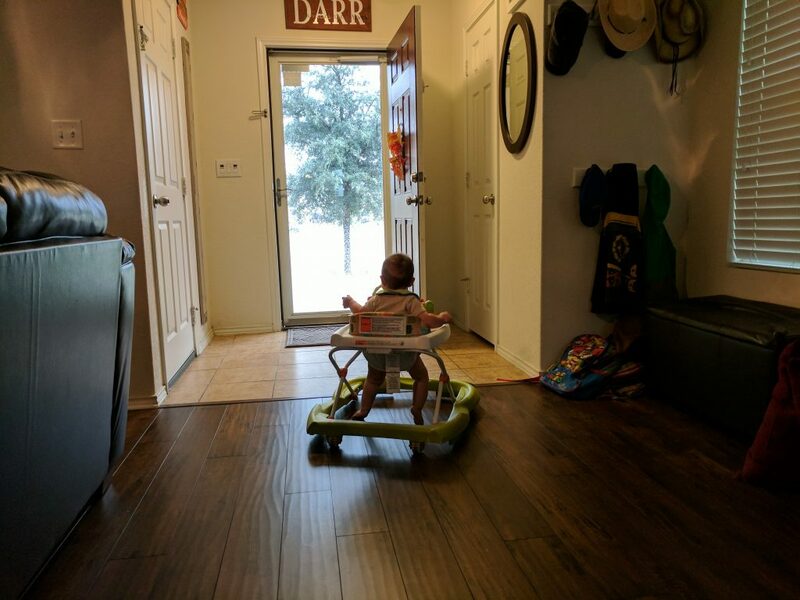 Abigail likes to see outside. Yesterday provided additional entertainment because the wind was whipping the tree around quite a bit.